Imagine eating at eleven of New York City’s most outstanding Japanese restaurants on the same night. For the roughly 130 people who attended Aki Matsuri 2011, that’s exactly what it was like. 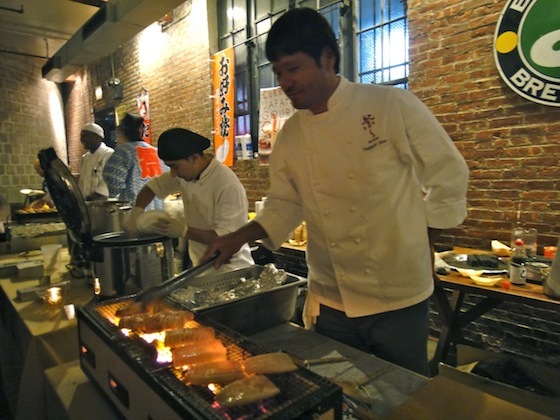 Aki Matsuri, which means “Fall Festival,” was the biggest fundraiser of the year for the Gohan Society, a non-profit organization dedicated to cultural education through the delights of Japanese cuisine. Grazing from table to table in the cavernous, exposed-brick confines of the Brooklyn Brewery, guests who plopped down $100 a head sampled a full range of Japan’s best dishes. Restaurants offered tried-and-true fare such as sushi – rolled by hand upon request by the folks from Blue Ribbon Sushi Brooklyn and Sushi Zen – okonomiyaki and takoyaki from the East Village eatery Otafuku, and Curry-Ya’s delectable beef curry. Guests also enjoyed delicious new twists: Pork sandwiches from Morimoto and ika yaki (grilled squid) with yuzu koshou (Japanese citrus/pepper mixture) from Matsuri and prepared by Chef Tadashi Ono himself. Wasan, a restaurant that applies traditional Japanese cooking styles to locally grown ingredients, provided a melt-in-your mouth salmon snack topped with mushrooms and chestnuts. There were even two variations on the standard chawan mushi (egg custard); a tremendous truffle chanwan mushi from EN Japanese Brasserie and delightfully light version from Brushstroke, David Bouley’s TriBeCa collaboration with the Tsuji Culinary Institute of Osaka. Soy rice pudding and pumpkin cupcakes from award-winning Japanese dessert bar Kyotofu added a nice taste of sweet for balance. Presentation is a key factor in Japanese cuisine, which is why Soba Totto’s dish exploded with green and red, making the East Side establishment’s table “look like a Christmas tree,” according to manager Shinya Kato. What’s food without drink? Various artisanal sake brewers brought out the best flavors of the food with sake from ASPEC (Akita Sake Promotion and Export Council), Tatenokawa, Hakkaisan, and TY-KU’s Soju, which claims to have half the calories of vodka. Suntory had four kinds of Yamazaki whisky, and the Brooklyn Brewery provided the beer (naturally). Legendary New York-based taiko drum group Soh Daiko performed their classic pieces. 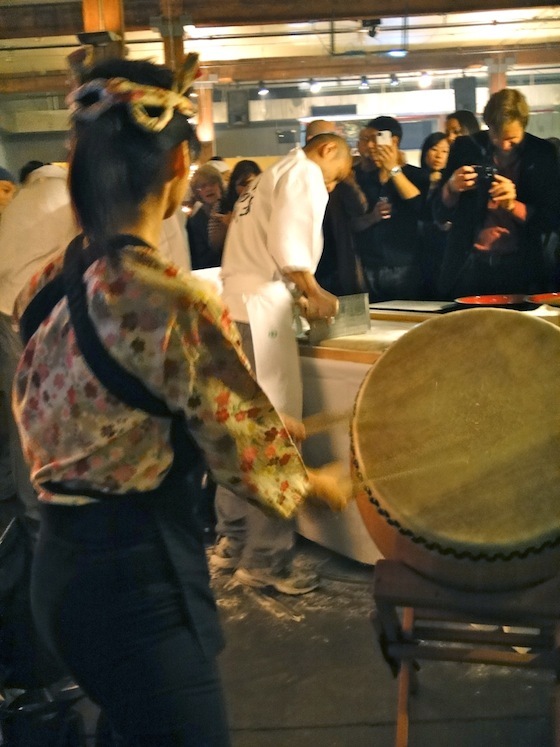 The highlight of the evening was Soba Totto’s soba chef Shuichi Kotani’s live soba-making demonstration, complete with thinly slicing the dough into noodles, done to the beat of the taiko drums. 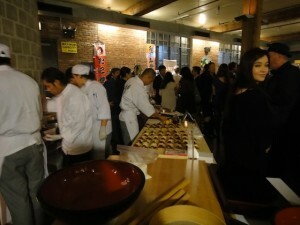 The cuisine fiends at Edible Manhattan blogged, “Aki Matsuri is our new favorite holiday.” I have to agree with them. Unless the Gohan Society puts on a Fuyu Matsuri.